It may well have been penned by many as the 'Devildriver country album', but much deeper thought has gone into Dez Fafara and co's new album Outlaws 'Til The End than just sticking on a stetson. "The kid with a Slayer backpatch often has a Johnny Cash patch too," Dez tells us. "The guy with the Pantera shirt will have Willie Nelson or Waylon Jennings records. These guys were the Lemmys of their generation, and they sit at the table with the heavy metal cats and eat dinner, no question about it. We wanted to bring some visceral, volatility to these covers, these covers have teeth. We wanted to give the outlaw aspect of these songs some kudos." We sat down with Dez to discuss each track in depth. "I've known Hank for many years, and what a lot of people don't know about him is that he does an hour of country music and then an hour of heavy metal in his sets. So, he gets it, he played in Superjoint Ritual and his great grandfather is Hank Williams, one of the original outlaws. I picked Hank because he doesn't skew his art for anyone, he isn't writing for the pop charts he isn't writing for anyone else but himself, he's making music from his heart and from his soul and doing music for his grandfather's legacy. I really didn't want to do this without Hank. "The reason we covered Country Heroes is because I thought it was one of the best songs ever written; it's about going to a bar and drinking with your country heroes, getting high with this guy and low with this guy. And I know he's got this Satanic Ozzy voice that he has never used, so I wanted to cover his song, with him, in this whole new way." "The most incredible song-writer of the genre, he's written hit songs for Patsy Cline and for pretty much everyone he's ever come into contact with. He champions farmers, he champions the common man, he's carrying on what Johnny Cash did in that respect. When you picture Willie Nelson, you picture an eagle or the American flag; it's just par for the course. "The reason we picked Whiskey River is because I wanted to put Randy Blythe on this track; both of us are now sober and so the lyrics 'Whiskey River take my mind, Whiskey River don't run dry, you're all I've got tonight,' are very poignant to us. I've been through it, you've been through it, we've all been through it – drinking to forget, to drown your sorrows. Willie we champion and welcome to the table of heavy metal." "We need to cover the outlaws first and foremost, after that we needed to bring in the outsider tracks. Are The Eagles outlaw country? I don't know, but look at the photos, every time it's cowboy boots and bullet belts outside of a saloon. They were Linda Ronstadt's backing band, so they came from a country background, but were they outlaws? Every time I read about a band rushing offstage to get their own private plane to get back to The Eagles nest in Colorado to see who could get the first hit of cocaine from the table, that's an outlaw story. "Outlaw Man would always be the track that I'd play on the back of the bus, and it says a lot about me and my lifestyle, which is why I didn't want to share it with anyone. So, there is no guest on that song. I'd been wanting to cover that my whole life." "One of Johnny's biggest songs, but he didn't write it. If you want to hear a version of it that is incredible in its rawest, truest, Americana roots then listen to Vaughn Munro doing it from the 40s. It's so haunting you'll have to turn on the lights at night. We needed something to make it raw and true, so we enlisted John Carter Cash, Johnny's son, his wife Ana Cristina Cash, and we invited Randy from Lamb Of God as well. "My wife and I flew to Cash Cabin in Nashville, which is hallowed ground, everybody has recorded there from Willie Nelson to, more recently, Chris Cornell before his passing. After I was done recording there I got to sign the big wooden mantle that Johnny put there in between Willie and Chris Cornell with a sharpie, that's going to live there forever. "The first hour all John Carter wanted to talk about was his love of heavy metal, and how it saved his life and how his dad embraced it; he showed me pictures of him as a ten-year-old with his dad and Ozzy at an Ozzy concert... and all I wanted to do was talk about my love of country music, the lyrics and the stories! But I think this is one of the best songs on the album, and it got the stamp of approval from the Cash family." "Johnny Paycheck was really known for his songwriting and his partying, and this song just had to be done right. It's all about the fact that he's too hard to handle, he's hell on wheels, and it kind of mirrored my story a little bit as I ran away from home at a very early age. "It's very reminiscent of what I went through. It's the consummate outlaw tune; it's very poignant if you know what I mean. It was actually pretty hard to turn into metal this one, we had a strange kind of groove, but we been getting a lot of thumbs up on this one." "George Jones' reputation in the United States precedes him. He was known for having some of the biggest concerts in the 1970s but also known for being called 'No show Jones'. He would just not turn up for a show and then the next day the cops would be following him as he rode a mower down the freeway at five miles per hour in his underwear and holding a beer. He's just that guy, he's as country as it gets and as unapologetic as it gets – when you talk about him you take a step back, you don't touch George! If we didn't cover George Jones then people in America would have asked why, he's an incredible songwriter." "Just one of my favourite songs of all time, it's really talking about what follows you to the next spiritual plane. You might be doing this and be doing that, but when the man comes around, you hear the trumpets, hear the pipers, you're done with this world and you're moving on. "I've always loved it. I wasn't sure how we were going to do the spoken word intro, but we were in the studio with Lee Ving from Fear and asked him to do it and it came out unbelievable! He's got this older, raspier voice that sounds so perfect. Plus, I was really proud of the band on this one, they really nailed it." "This is one of my favourite tracks ever. I've been on the road for 25 years and when it was brought to the table I went 'yes' straight away. Let me tell you about Dwight Yoakam, he is the real deal; he never sold out to write a radio hit, he's got a swagger like Elvis, keeps his hat real low over his eyes, he's like a sneaky outlaw. Actor, philanthropist, never skewed his art, he can come sit at the table." "Great songwriter Steve Earle, and definitely included in the outlaw list. This song is about moonshining, the early years of America, families outrunning the law to make moonshine. 'Whatever you do, don't go down Copperhead Road, they're moonshining'. "I don't drink anymore, but I've had more moonshine than anyone. I had so much with Hank III once that I even ate the cherries in the bottom! An hour later I was throwing up so hard! Hank said, and my wife always says it to me once a year, 'I ain't never seen nobody eat the cherries!' Ha ha! But that's why we covered it, it's very outlaw with the moonshine, and the running from the cops theme. And I gotta give Brock (Lindow, vocals for 36 Crazyfists) props for this song, because his voice is so unique that he just makes it." "I had never heard of this song, but it was suggested to me and I saw that it had 40 million views on YouTube! 40 million! It's an anti-war song, written from the perspective of a guy in Iraq, and it's brutal. I thought it was originally about domestic violence, but there are a lot of war references in it too. Burton C Bell absolutely kills it on this track. I said to Burt 'I've not heard you sound like this since the first Fear Factory record,' and he said 'I was channeling my true self,' which is so great." "Gotta cover Hank's father, and this song is just about the feeling of being in America – 'Hey, a country boy can survive.' Whatever you wanna do to me, a country boy can survive. You look at the American flag and that is what you feel, I'm sure every country feels it for their own flag too, but that's definitely how we feel in America. And a lot of the guys in the military who are fighting for us are from the country, so they really need to feel like that. So, this song had to be done – I know for a fact that if we hadn't covered this song people would have asked me why not. You can have this played after Slayer at a barbecue and people will go just as crazy." "David Allen Coe, completely Americana, completely outlaw – he's written for everyone from Cash to Willie, he's an incredible songwriter. I was turned on to David Allen Coe by Dimebag Darrell and Vinnie Paul, both of them rest in peace – the Pantera bus would play him constantly. The song is an outlaw song, everyone knows this tune and it goes straight to their heart. It's a true story about Hank Williams senior being picked up in a Cadillac by a young dude, and the guy is talking to Hank, he looks back and sees he's dead. Now he has to drive Hank's lifeless body back, and on the way Hank's ghost visits him. It's just incredible storytelling." 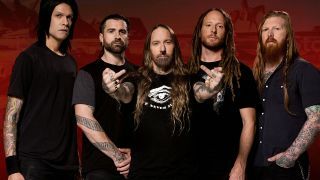 Devildriver's new album Outlaws 'Til the End: Vol. 1 is out July 6 and available to buy now from Amazon.